Located in the far north valley, the Carefree Resort represents the history of Arizona resorts with plenty of space and views without the hustle and bustle of the big city. Of course, it is close enough to enjoy all the amenities of the metro area but as one of only two resorts in the immediate Carefree – Cave Creek community area, it allows its guests to completely unwind in these rustic and charming areas. The resort also completed a room renovation in 2011 designed to appeal in the most discerning guests. One the border of Scottsdale and Carefree, the Boulders continues to offer one of the most unique locations in Arizona. Built within and around some spectacular outcroppings of rocks with some as big as large buildings, the setting provides for an incredible experience. When the two Jay Morrish designed golf courses and Golden Door Spa are added to the mix, this award winning resort is certainly among the best in not only Arizona but in the world. One of the newer mega resort properties in Arizona, the Desert Ridge Resort offers 950 rooms including 81 suites. Two championship golf courses at Wildfire Golf Club offer great challenge for golfers of all abilities while the Revive Spa offers 41 well appointed treatments rooms offering a variety of experiences for every taste. Eight tennis courts and a full service tennis shop provide everything a tennis player needs whether a novice or very experienced participant. More than 4 acres of crystal blue pools including a lazy river allows for a great way to relax after enjoying all the resort has to offer. Designed by the famed Frank Lloyd Wright, the Arizona Biltmore Resort still looks as timeless as it did when it opened more than 80 years ago and has been graced by numerous U.S. Presidents, celebrities, and other travelers seeking one of Phoenix’s premiere resorts. An enormous pool surrounded by cabanas, lounge chairs and a pool side bar are at the center of this vast resort. There are eight pools all together. Two golf courses, seven tennis courts, a spa, and plenty of walking space round out the convenient activities which are on site. Built in the southern foothills of one of Phoenix’s most prominent landmarks, Camelback Mountain, the Phoenician offers spectacular mountain and city views. The resort includes 27 holes of championship golf, tennis, a cactus garden nature trail, two large pools, spa, restaurants with stunning views and menus to match. Although not at the very top of Camelback Mountain, Sanctuary is probably located higher on the mountain than any other resort in the Phoenix area providing great views of the Paradise Valley community that it overlooks to the North of Camelback Mountain. Miraval Arizona Resort and Spa - Experience this groundbreaking Tucson Arizona luxury spa resort. Pools are always an important consideration when choosing an Arizona Resort. 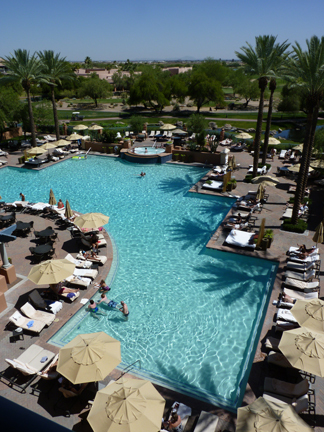 The Scottsdale Princess offers separate pools for adults and families to keep everybody in the resort happy.